Veronica Loretta 'Roni' Stoneman, 'First Lady of Banjo', grew up playing music in the family band founded by her father, Country Music Hall Of Fame member Ernest V. 'Pop' Stoneman (1893-1968) of Virginia, whose 1925 recording of 'The Titanic' was a best-seller. 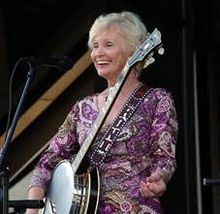 In her teens, she became the first recorded woman bluegrass banjo-player, on the first-ever bluegrass LP. Later, Roni was a core member of the cast in the country music/comedy US TV series 'Hee Haw', and joined the Old Time Country Music Hall of Fame in 1979. Roni's story is told in her own Pressing on (2007) and in Murphy Henry's Pretty good for a girl: women in bluegrass (2013), both from University of Illinois Press. This is a unique opportunity for lovers of Americana to meet a historic musician and entertainer in her own right, with a family background that sets her only one generation away from the beginnings of recorded country music. On the first visit to Ireland in her long and full career, Roni remains an impressive musician and an exuberant performer. Appropriately, she is joined on stage at the Purty Loft by Hugh Taggart (guitar) and John Denby (mandolin), two of the most dynamic and accomplished young players emerging on the bluegrass scene in Ireland.